Making a family tree can be a fun and meaningful school activity to help students recognize the importance of a family. Lots of kids are curious about the past of their family, what did his/her great grandmother do, did their ancestors experience the historical events and what's their roles in there... they really want to dig up clues and learn about their ancestry. Mapping a family tree can be a good chance for students to study their family and trace their roots. Students need lots of research work to do to finish this activity. They have to try every mean to get what's useful for them. Ask them to go home and have a full check from photos, old documents, family heirlooms, videos and slides, the discarded furniture in the attic or basement, and some old boxes or locker. Select out useful information and save for later use. Let them be creative. Encourage them to boost their imagination to make eye-catching and unique family trees. They can try whatever they could to present the family tree. Sketch with color pens, decorate using paper cuts, use templates from the internet, or design with a family tree software. Great works will be displayed in class. 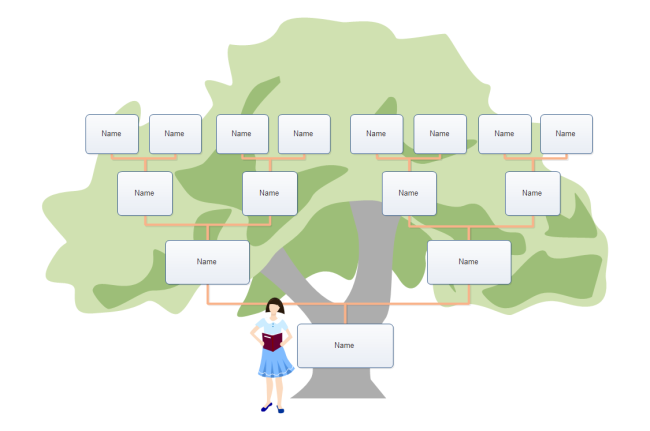 Below is a simple family tree template for kids, to have more family tree templates, you can download edraw software and discover more powerful features in making various diagrams.